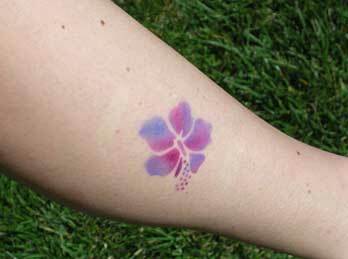 Airbrush Tattoos are a very popular form of party entertainment. We offer many different types of Airbrush Tattoos for Bar Mitzvahs, Bat Mitzvahs, Corporate Events, Quinces, Sweet 16's, Weddings, and more! We are South Florida's #1 choice for Airbrush Tattoos & Body Art. Why settle for companies that use a small selection of airbrush tattoo designs when we have the largest selection of airbrush tattoos in south florida. Our custom made banners have the best selection of airbrush tattoos designs and we can accent your Airbrush Tattoos with glitter. We have designs for kids, adults, boys and girls. We also have a custom made banner specifically for bar mitzvah and bat mitzvah parties. Our party display is attractive and designed to entice guests to approach our airbrush tattoo display. 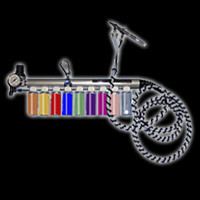 We use the fastest best airbrush tattoo equipment in the industry! Our proprietary set up is fast and quiet. We provide "unlimited" tattoos by the hour and our quick change ink system allows our artists to change the ink color quickly so you get more tattoos for your money. 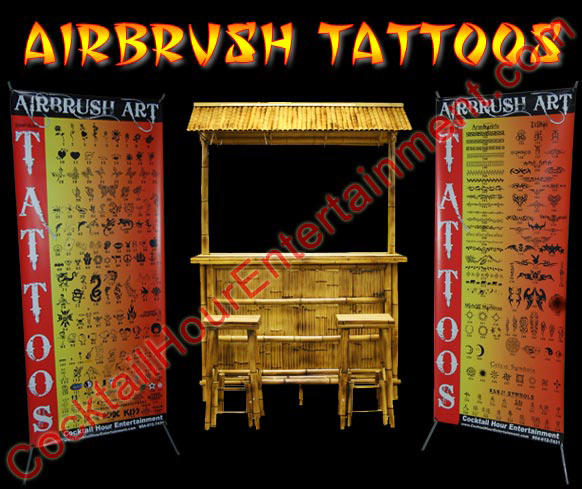 2 custom made Color Banners displaying hundreds of the hottest Tattoos available. Banners make it easy for your guests to choose from a wide assortment of Tattoos and it is more professional looking. We designed our own banner by 1st ordering all the hottest stencils from all the different companies that sell them, then we took images of all the stencils (tattoo designs) and created our own custom banners so your guests get to choose from the best selection of Airbrush Tattoos anywhere! The 1st problem is their displays are limited to the stencils that particular company sells so they have less of a selection since different companys have trademarked different tattoo designs. The second problem is most of the premade banners look professional, but they contain very few actual "cool" stencils so your guests are getting a smaller selection. Take a close look at some of these pre-made banners and you'll notice they have balloons, clowns, crosses, crucifixes and other designs that are inappropriate for Bar/Bat Mitzvahs. We paid attention to those details...why didn't they? Do you want to hire an Airbrush company that specializes in carnivals & fairs for little kids or Bar/Bat Mitzvahs for teens and adults? We spent months designing our own banner displays b/c we think your party's worth it! Quantity & Quality best describes our stencil selection! We thought about all the hottest stencils people ask for and we delivered! We have all the florida sport team logos; Gators, Seminoles, Hurricanes, Miami Heat, Marlins, Panthers, Dolphins, etc.... We have a wide selection of Tribal Tattoos, Tribal Armbands, Celtic Designs, Kanji Symbols, Famous Faces, Hearts, Roses, Skulls, Dragons, Dolphins, and Henna. We even have trademarked logos like Apple Computer, Superman, Batman, Bruce Lee, and more! For the Bar Mitzvahs and Bat Mitzvahs we have several Jewish Star designs, Chai's, the Hand of God, Israeli Flag, and more! No one has a better selection of tattoo designs for your party! Q: Are Airbrush Tattoos safe? 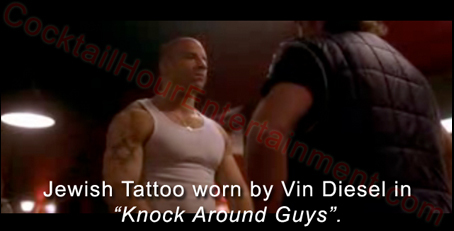 Q: How long do Airbrush Tattoos take to apply on a person? 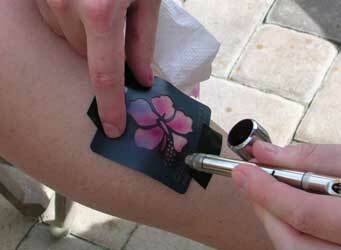 A: It only takes one to three minutes to apply Airbrush Tattoos. Q: How long do Airbrush Tattoos last? Tattoo ink available in the world. Alcohol Based Airbrush tattoo Body paint lasts longer than Water based airbrush body tattoo piant. 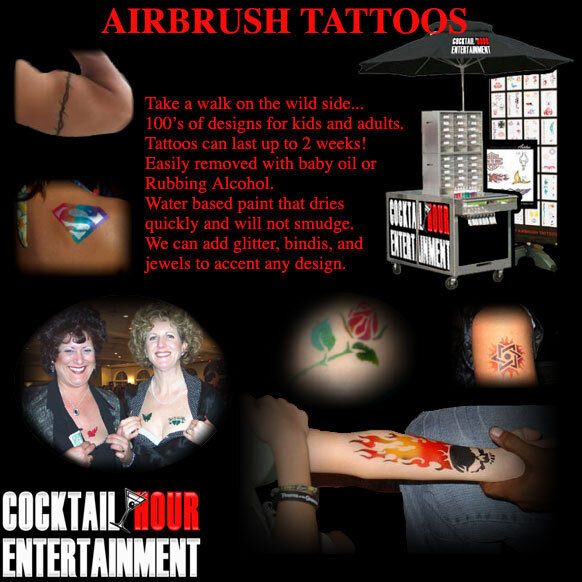 We can customize our airbrush tattoo display with custom made stencils for your party. We can incorporate your logo, favorite sport team, or anything else you can imagine.